What most people fail to understand is that when chemicals enter the body, they don’t remain isolated. You may get chemicals entering the body from different sources at different times. But as they work their way around the body some may combine with other chemicals which can have devastating effects, as the experiments below shows. What kind of impact can this have on an unborn or newborn child? A health report on drinking water treatment linking Alzheimer‘s mental health disease in the elderly to drinking water treated with aluminium sulphate, alumina, by municiple treatment filtration filter systems. Aluminum – Why a Concern in Drinking Water? The post below will be upsetting for many people because it goes against their core beliefs and may dismiss it outright. But if you look at the real science, this article makes total sense. Toxins where ever they come from have a cumulative, synergistic toxic affect on all of us. They slowly degrade and diminish us bit by bit. For some it can come a lot quicker. The scientific facts speak for themselves. CTD is a robust, publicly available database that aims to advance understanding about how environmental exposures affect human health. It provides manually curated information about chemical–gene/protein interactions, chemical–disease and gene–disease relationships. These data are integrated with functional and pathway data to aid in development of hypotheses about the mechanisms underlying environmentally influenced diseases. These diseases are associated with Aluminum or its descendants. These diseases are associated with Fluorine Compounds or its descendants. Children’s Health Defense note: When it comes to aluminum and mercury, one plus one does not equal two. The toxicity of mercury alone, and the toxicity of aluminum alone—both of which are concerning enough—are each far below the toxicity that results from exposure to both. 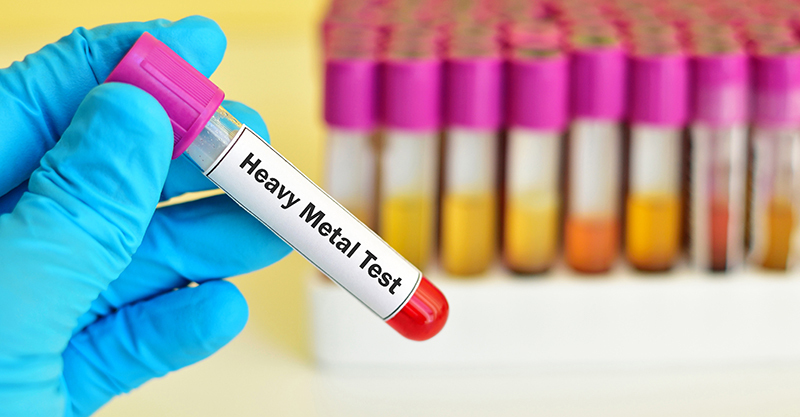 Tests of the two metals in combination show that the toxicity levels skyrocket. How long have regulators known this fact? 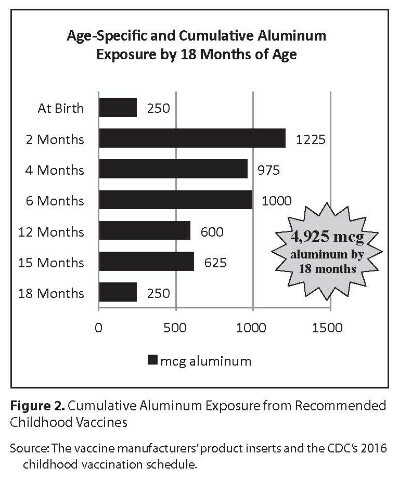 …the reasoning that has allowed such high levels of aluminum to remain in childhood vaccines is deeply flawed and places infants at risk of acute, repeated, and possibly chronic exposures of toxic levels of aluminum. Government regulators are well aware of these facts. For decades, the agencies in charge of protecting human health have used “lethal dose” (LD) estimates from studies in mice or rats to characterize the toxicity of a given substance or combination of substances. An LD of “1” (LD1) refers to the dose that would cause death in 1% of subjects (one in 100). A study conducted 40 years ago dramatically illustrated synergistic toxicity, showing that an LD1 dose of mercury administered together with a fraction (0.05%) of the LD1 dose of lead killed not 2% but 100% of the animals. A new experimental study in human brain cells establishes that co-exposure to mercury and aluminum indeed results in a significant synergism that is far worse than exposure to either substance on its own. The study, carried out by an international trio of researchers from the U.S., Canada and Russia, takes as its starting premise the fact that both mercury and aluminum are capable of provoking a pro-inflammatory response that is damaging to brain cell structure and function. Inflammation and immune system alterations are some of the earliest signs that a neurodegenerative process has been set into motion. To carry out their study, the researchers added aluminum sulfate and mercury sulfate reagents (at five different concentration levels) to human brain cell cultures, both singly and in combination, and incubated them for 24 hours. They then measured the extent to which aluminum exposure, mercury exposure or aluminum-plus-mercury exposure increased the amount of a pro-inflammatory marker called nuclear factor-kappa B (NF-κB)—a family of “transcription factors” (proteins) that help control gene expression and play a major role in immune and inflammatory responses, among many other cellular processes. (The researchers looked at a specific NF-κB complex called NF-κB p50/p65.) Studies have described abnormal regulation of NF-κB as a telltale feature of many neurodegenerative and chronic disorders. First, the researchers observed that incubation with either aluminum sulfate or mercury sulfate significantly increased NF-κB. Second, adding both neurotoxic metals together synergistically brought about an even more significant increase in NF-κB. Finally, the researchers observed a “classic” dose-response relationship for NF-κB with each of the first three levels of added aluminum and mercury, meaning that for each increase in the concentration of aluminum, mercury, or aluminum-plus-mercury, there was a corresponding increase in NF-κB levels. In short, the researchers found that the NF-κB (p65) complex was “significantly up-regulated by both aluminum sulfate and mercury sulfate, and synergistically by aluminum sulfate and mercury sulfate together.” The combination of aluminum plus mercury produced NF-κB levels that were two to nine times higher than those prompted by either metal alone. Moreover, there is little evidence that anyone has studied the respective effects or potential synergy of the half a dozen distinct forms of aluminum adjuvant present in vaccines—with as many as three different types included in a single vaccine such as Pediarix. The new study’s use of NF-κB as a proxy for assessing the onset of pathophysiologic processes and inflammatory neurodegeneration represents a logical step toward greater understanding of the two metals’ synergistic neurotoxicity. Many other studies have highlighted the NF-κB signaling cascade “as the point of convergence of multiple pathways associated with the development of…neurodegenerative pathologies,” including Alzheimer’s disease, multiple sclerosis and amyotrophic lateral sclerosis (ALS). NF-κB signaling is also highly relevant for autism spectrum disorder; one study concluded that because “NF-κB is a response to stressors of several kinds and a master switch for many genes, autism may…arise at least in part from an NF-κB pathway gone awry.” Future research, according to the authors of the aluminum/mercury study, should study the effects of combined aluminum and mercury on other neurologically important molecules and also examine other combinations of prevalent neurotoxic metals. Implementation of rigorous vaccine safety measures represents an even more urgent challenge. As many observers have pointed out with regard to aluminum adjuvants, their presence in vaccines is not backed up by any suitable safety studies. Moreover, there is little evidence that anyone has studied the respective effects or potential synergy of the half a dozen distinct forms of aluminum adjuvant present in vaccines (see list below)—with as many as three different types included in a single vaccine such as Pediarix. Government agencies have known about synergistic toxicity for decades but continue to allow pregnant women and young children (from the day of birth) to be injected with neurotoxic aluminum and mercury in dozens of vaccines. Parents and concerned citizens need to ask regulators to explain why no alarm bells are ringing, and why institutional inertia continues to prevail in the face of these documented risks.